The city of Tucson is often considered a success story in promoting conservation and proactive water management. 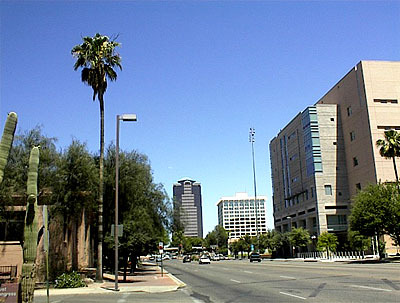 Tucson Water is a department of the City of Tucson government and operates as a Public Water Utility. After decades of rapidly declining aquifer levels, Tucson implemented a number of policies and physical investments to restore the aquifer, encourage conservation, promote long-term environmental stewardship, and provide all residents access to green space. Tucson also has a number of innovative programs, including the conserve to enhance program which provide small grants to local organizations seeking to improve the community through projects like water-harvesting and habitat restoration. Despite a flourishing economy and increased population, Tucson has consistently decreased annual treated potable water use since its peak in 2002. Of this total use, roughly 60% of water is used for indoor purposes and 40% used outdoors. Tucson Water is currently developing a Water Resource Plan to determine long term water supply needs and sources. Tucson has three primary water sources: 1) the Tucson Aquifer, the Colorado River, and effluent or reclaimed wastewater. In the 1990’s and early 2000’s the groundwater depletion rates in Tucson were severe. But from crisis comes opportunity, and city officials and utility managers developed a plan to reduce pumping and improve recharge using Colorado River water. This effort has been largely successful and groundwater levels for the majority of the aquifer have plateaued or increased in recent years. Tucson has a very developed water reclamation program and sells approximately 11,000 acre-ft of reclaimed water each year. Tucson Water was one of the first utilities in the nation to adopt a large scale recycled water program for the purpose of irrigation, dust control, firefighting, and industrial uses. There are also three major water reclamation plants in the Tucson region operated under the Pima County Water Reclamation Department, which largely uses the reclaimed water to irrigation of parks, golf courses and ball fields. This recycled water system boasts over 160 miles of pipe and 15 million gallons of surface storage. In addition to the recycled water program Tucson also encourages small scale rain collection for irrigation purposes. Stormwater is managed by the Stormwater Management Section of the Tucson Department of Transportation. Tucson has a large number of floodways and significant investments in infrastructure to mitigate damages from flash flooding which is common in the region. Stormwater managers in the area encourage individuals to harvest water, for irrigation both to reduce potable water use and a means to help with flooding issues. The majority of Tucson’s water comes from the Tucson Aquifer and the Colorado River, although it is difficult to untangle these two supplies since large scale infiltration facilities pump excess Colorado River water into the aquifer. Although Tucson is not located along the Colroado River, the Central Arizona Project was completed in the 1990’s and now transports around 135,000 acre-ft to the city each year. The city uses around half of this water each year and the rest is diverted to the Clearwater Renewable Resource Facility in Avra Valley. The water is then infiltrated to recharge the native groundwater supply. In recent years, the Tucson Aquifer has largely recovered to pre-anthropogenic levels after decades of decline. The groundwater in the regions is comprised of sub-basins: the Upper Santa Cruz Valley Sub-basin and the Avra Valley Sub-basin, both of which contain substantial amounts of water.